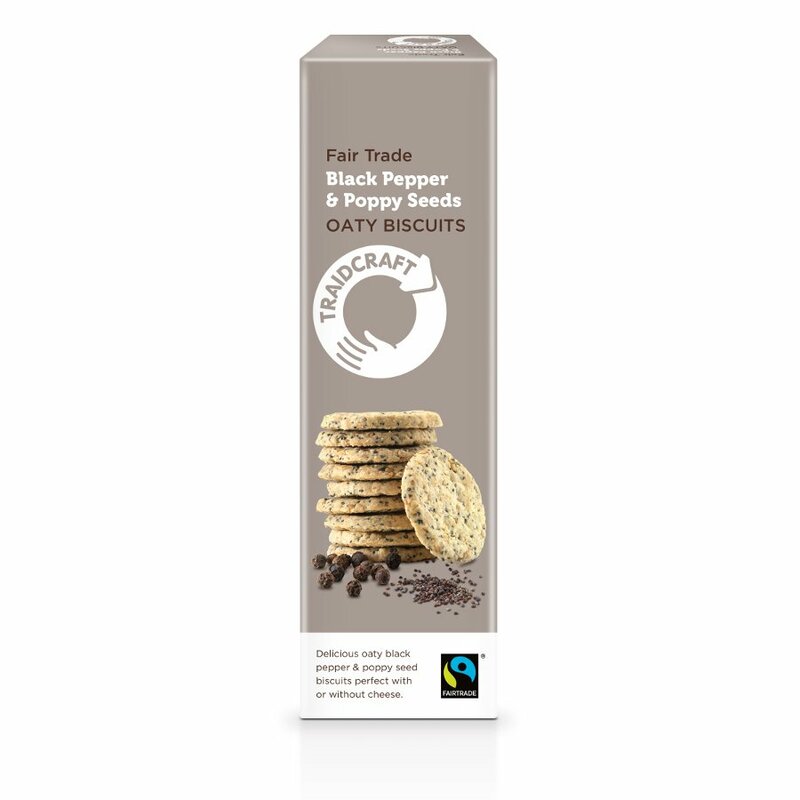 Traidcrafts’ Fairtrade black pepper & poppy seed oaty biscuits are made from Fairtrade rice flour and organic fair trade palm oil produced by smallholders in Ghana. They are ideal with cheese or simply on their own and you can savour the great taste whilst feeling good about your choice of snack. May also contain nuts, egg, mustard, sesame & soya. Store in a cool dry place, out of direct sunlight. Once opened store in an air tight container and consume within 30 days. Fortified Wheat Flour (Wheat Flour, Calcium Carbonate, Iron, Niacin-Vitamin B3, Thiamin-Vitamin B1), Rice Flour, Palm Oil, Oatmeal (13.8%), Water, Poppy Seeds (7.4%), Sugar, Salt, Black Pepper (0.8%), Raising Agents: Disodium Diphosphate, Sodium Bicarbonate. For allergens, including cereals containing gluten, see ingredients in bold. May also contain nuts, egg, mustard, sesame & soya. The Traidcraft Fairtrade Black Pepper & Poppy Seeds Oaty Biscuits -130g product ethics are indicated below. To learn more about these product ethics and to see related products, follow the links below. There are currently no questions to display about Traidcraft Fairtrade Black Pepper & Poppy Seeds Oaty Biscuits -130g.